Honeycomb Brings R&B flavor with singer Lamone's brand new double single! PICK UP YOUR COPY OF "I'LL WRITE A SONG FOR YOU"
Honeycomb Music is so proud to showcase another side to its illustrious sound and style with the always fantastic Lamone. 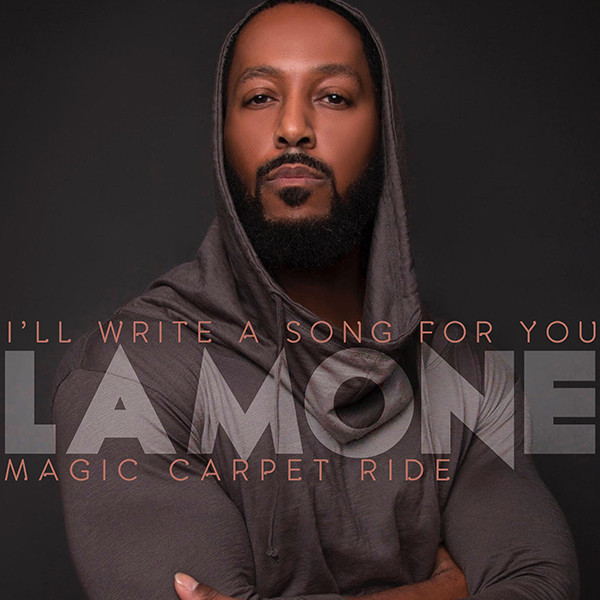 His brand new double single, "I'll Write A Song For You" b/w "Magic Carpet Ride," combines Lamone's sultry R&B sound with super producer Josh Milan's signature jazz meets house style. The result is an epic release with a strong message of love light and magic! Lamone’s falsetto vocals mixed with Milan’s live instrumentation makes this a very special release! Who is Lamone? Lamone, the self proclaimed "X-man" aka (Lomon Andrews), pulls in the crowd. He is a must hear, multi-talented vocalist, songwriter, producer, and must see performer with an incredible vocal range. Born and raised in Waterbury Connecticut, and being a product of "Generation X", Lamone is no stranger to going against the grain, or straying from the norm. Never a follower, always a leader, this "soulja" of music and art blazes his own trail. With his ability to channel and evoke the artistry of such legends as Al Green, Marvin Gaye, Sam Cooke and Donny Hathaway, Lamone has devolped a soulful yet eclectic style all his own. That ability combined with his dynamic stage presence commands audience attention at every show. Growing up, "Lomon" heard music all the time - "day in and day out." His mom sang at home and in church and his dad always listened to all the latest music, which had a tremendous effect on Lomon growing up a 70's soulchild. Influenced by his idols: Donny Hathaway, Stevie Wonder, Marvin Gaye, Patti, Chaka and Aretha, Lomon started singing at the age of 10 and hasnt stopped. When asked what singing does for him Lamone replied: "Singing is my high, it relaxes me and reduces all tension." He recently toured America with Najee. Lomon sang "Falling in Love" on Najee's CD, entitled "My Point of View," released in August 2005. Lamone is always working on new music, videos and projects! Ladies and Gentleman, this is one "exclusive" artist you don't wanna miss. So stay tuned! The wait is now over. Lyrics written by Al McKay, Philip Bailey and Steve Beckmeier. All vocals performed by Lamone Andrews. All instruments except guitar performed by Josh Milan. Guitar performed by Sheldon Goode. Published by Steel Chest Music (ASCAP), EMI April Music Inc (ASCAP) and Sir and Trini Music (ASCAP). Lyrics written by Lamone Andrews. Lead vocals performed by Lamone Andrews. Background vocals performed by Lamone Andrews and Josh Milan. Published by Lomon Andrews (ASCAP) and Josh Milan Songs (BMI). Cover photo by Tarik Carroll.